"Snackable" vignettes, presented vertically, show off Rio stars like Syrian refugee Yusra Mardini. From sponsoring the first team of refugee competitors to tweeting photos of disabled athletes, Visa has been putting diversity and acceptance at the center of its 2016 Olympics sponsorship. Now, the brand is bringing those themes to a 360-degree experience that it hopes consumers will want to share. Visa’s 360-degrees of Acceptance, created in partnership with Razorfish and WebGL, is an interactive mobile experience comprising 12 "stories" of diverse Olympic athletes. Each story is a short vignette, about 15 seconds long, consisting of inspirational sayings, videos, and photos of athletes. The vignettes are short on biographical information, but rely instead on uplifting quotes and compelling graphics to associate the brand with athletes who don’t fit the Olympic mold. The tagline, featured in each vignette, is "celebrating the acceptance of everyone, everywhere" — a reference to the diversity of the athletes and Visa’s claim of longstanding claim of being accepted in more places than any other card. Shiv Singh, Visa’s SVP and global head of digital and marketing transformation, calls them "snackable stories" that show the brand is "taking a strong stance on accepting everyone." Singh says the theme of acceptance fits with the Visa brand, which operates in 200 countries, and is celebrating its 30th year as a sponsor of the Olympic Games. "Visa is about being there for you wherever you want to be," says Singh. "Because we are a human-centered brand, the theme of universal acceptance comes naturally, and that’s what the Olympics is all about, too." One of the athletes featured in the experience is Syrian refugee Yusra Mardini. Though users will have to look elsewhere to learn how a Syrian refugee made it to the Rio games, the Visa experience does provide photos of her at the Olympics with a voiceover saying "Yusa Mardini's harrowing journey from Syria to Rio has given her, and other refugee athletes an Olympic flag to train under." Visa did make a TV commercial with BBDO New York that centered on Mardini’s story, which aired during the Olympics on August 5. The 30-second ad tells the story of Mardini fleeing her home in August 2015. The boat she was on began to sink, and Mardini took action. For three hours, she and her sister pushed the boat until they arrived in Lesbos, saving 17 lives in the process. Another 360-degree vignette features Daniel Dias, a Brazilian Paralympic swimmer born with congenital malformation of his arms and right leg. The story explains how he dreamed of swimming as a child, holds 11 world records, and will be competing in the Paralympics in September. 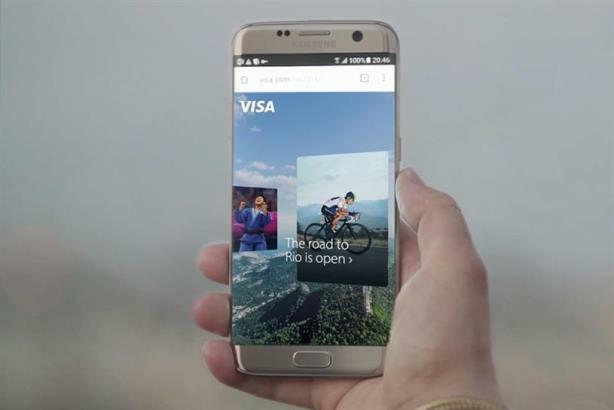 Visa’s 360-degree experience was designed for mobile devices. Therefore, the videos and content take a vertical format because, as Singh says, "Nobody wants to turn their phone horizontal." Before seeing the vignettes themselves, visitors to the site are asked to swipe, dip, or insert an image of a Visa credit card, showcasing the different ways one can pay with a Visa card. At the end of each story, the brand has placed a call-to-action: "Stand for universal acceptance by sharing this experience." The experience has been released in 81 markets in seven languages. According to Singh, these markets generate more than 45 million visitors a year to visa.com. The site launched on Monday, but Visa declined to comment on traffic or sharing activity so far. What brand real-timed #PhelpsFace best?